Full of Hot Air. Журнал «WHAT’S ON», №33/2010 10-16 сентября | Киевский клуб воздухоплавательного спорта "Пилот"
Growing up, I was always a passionate reader of Jules Verne, and having reached the tender age of 25, I’ve still yet to fall out with the adventurous spirit all of his boors are imbued with. What I’ve found, however, is that the excitant and serenity that exist between the pages of those books can be had in real life, all you have to do is make an appointment. Ever dreamed about watching the sun rise from below the horizon, 300 me­ters up, while the rest of the world is only waking? 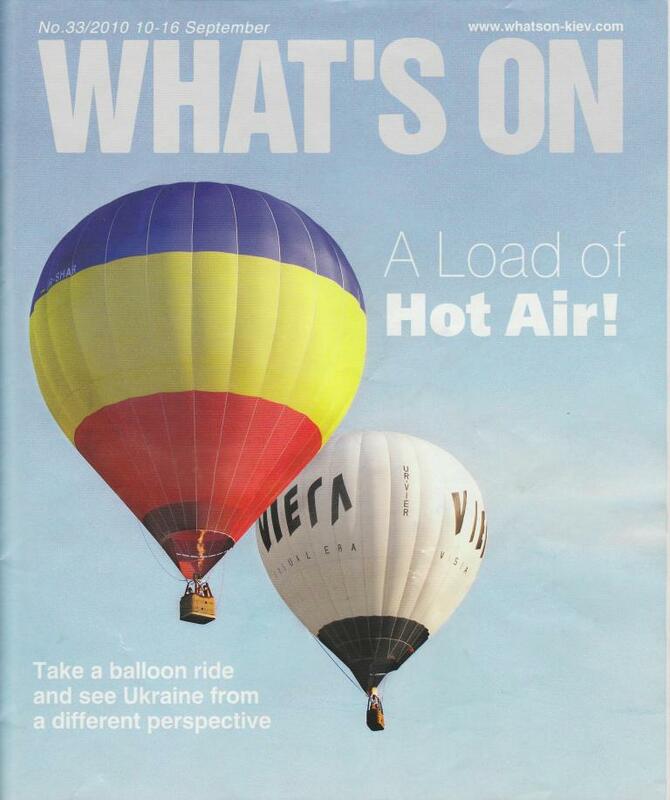 Luckily for those young, old, and almost everyone in between, ballooning is something that can be enjoyed by all. The only requirements necessary is a height of at least 1.2 metres tall, weight that does not exceed 113 kilograms, and a precautionary ex­clusion of pregnant women. It’s Saturday, 3.30 am, and while normal folks are still sleeping or dancing the night away at any and all possible clubs in the city, I am get­ting myself ready to fly; something I’ve always wanted to do. Before I go, I awake the dogs from their dreams about the cat next door, and looking rather surprised and suspicious at my sudden willingness to walk them in the middle of the night, we head out. Unfortunately, they come with me, so tucking them back in, I hop into a taxi and make my way to the agreed meeting point on Odes’ka Square. Once there, I realise that the friend who said he would ac­company me is not. But I suppose it is very early for the weekend, or any other day for that mat­ter, and so sipping on my morning coffee, I chat with the pilot. There is another pilot with us who wants in on the conversation and continuing this little his­tory lesson says, «Because balloons at that time were seen as a very dangerous hobby, King Louis XVI, in power at the time, decreed that criminals would pilot the first balloons. This, however, would mean that the men to go down in his­tory as the first ever pilots of ballooning would be the bad guys! To ensure this would not hap­pen, many French noblemen petitioned against it. Unfortunately, this did not solve the problem with regards to who would man the first flight, and so motivate the aristocracy, kind King Louis ruled that he who agreed to fly the first balloons would then be granted all of the land he flew over.» Now that was a good deal indeed! By 06.00, we have finally made it to the take off site, and while I would love to hear more stories, the pilots are busy inflating the balloons and do­ing all of the necessary checks. While I’ve been up for hours, I can’t help but yawn. We have been told that we actually need to fly this early so that we don’t interfere with whatever solar activity is going on in the sky (06.00-07.00). We could have gone out in the evening as well (18.00-20.00), and I’m absolutely positive that ballooning at night would be breath-taking. 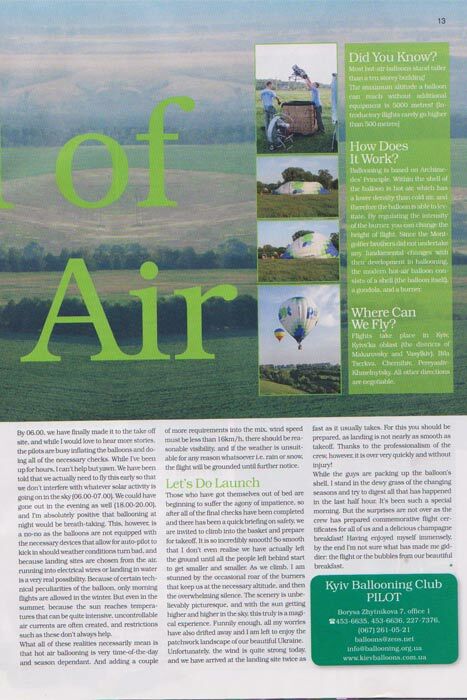 This, however, is a no-no as the balloons are not equipped with the necessary devices that allow for auto-pilot to kickinshould weather conditions turn bad, and because landing sites are chosen from the air, running into electrical wires or landing in water is a very real possibility. Because of certain tech­nical peculiarities of the balloon, only morning flights are allowed in the winter. But even in the summer, because the sun reaches tempera­tures that can be quite intensive, uncontrollable air currents are often created, and restrictions such as these don’t always help. What all of these realities necessarily mean is that hot air ballooning is very time-of-the-day and season dependant. And adding a couple of more requirements into the mix, wind speed must be less than 16km/h, there should be rea­sonable visibility, and if the weather is unsuit­able for any reason whatsoever i.e. rain or snow, the flight will be grounded until further notice. Those who have got themselves out of bed are beginning to suffer the agony of impatience, so after all of the final checks have been completed and there has been a quick briefing on safety, we are invited to climb into the basket and prepare for takeoff. It Is so incredibly smooth! So smooth that I don’t even realise we have actually left the ground until all the people left behind start to get smaller and smaller. As we climb, I am stunned by the occasional roar of the burners that keep us at the necessary altitude, and then the overwhelming silence. The scenery is unbe­lievably picturesque, and with the sun getting higher and higher in the sky, this truly is a magi­cal experience. Funnily enough, all my worries have also drifted away and I am left to enjoy the patchwork landscape of our beautiful Ukraine. Unfortunately, the wind is quite strong today, and we have arrived at the landing site twice as fast as it usually tare. For this you should be prepared, as landing is not nearly as smooth as takeoff. Thanks to the professionalism of the crew, however, it is over very quickly and without injury! While the guys are packing up the balloon’s shell, I stand in the dewy grass of the changing season and try to digest all that has happened in the last half hour. It’s been such a special morning. But the surprises are not over as the crew has prepared commemorative flight certificates for us and a delicious champagne breakfast! Having enjoyed myself immensely, by the end I’m not sure what has made giddier: the flight or the bubbles from our beautiful breakfast. Most hot-air balloons stand taller then a ten storey building! The maximum altitude a balloon can reach without additional equipment is 5000 metres! (Introductory flights rarely go higher than 500 metres). Ballooning is based on Archimedes’ Principle. Within the shell of the balloon is hot air, which has a lower density than cold air, and therefore the balloon is able to levitate. By regulating the intensity of the burner, you can change the height of flight. Since the Montgolfier brothers did not undertake any fundamental changes with their development in ballooning, the modern hot-air balloon consists of a shell (the balloon itself), a gondola, and a burner. Flights take place in Kyiv, Kyivs’ka oblast (the districts of Makarovsky and Vasilkiv), Bila Tserkva, Chernigiv, Pereyasliv-Khmelnytsky. All other directions are negotiadle.